Dedicated towards setting new standards greener and better tomorrow and challenging conventional.Socially -motivated outlook towards business approach.Initiated and managed various Project for livelihood and creating awareness about EM farming method among farmers. Funds to establish our self sustainable model for our Project.Once we get adequate funds we will be able to generate revenue for our project within our business model. Abhishek Pandey, a hospitality and catering graduate, noticed that customers were being charged exorbitant prices for organic food while interning at a famous chain of hotels. This seemed unfair to him – why should anyone pay more for organic food? Why do the profits from the organic food industry not trickle down to the person who toils the hardest against all odds — the farmer? 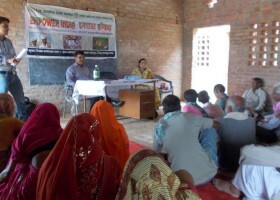 How can these farmers be empowered?